Low expansion plastic throwing and handbuilding body with fine grog. Raku-Throwing tries to achieve a balance between to opposing challenges of the raku process: The ability to withstand rapid changes in temperature without cracking and being smooth enough to throw comfortably on the potter's wheel. The recipe employs 64% of our A3 buff stoneware clay, 14% Pyrophyllite, 14% Mulcoa 47-35 grog, 5% 20-48 regular grog and 3% bentonite. This produces a sieve analysis of 5% +35 mesh, 3% +48 mesh. 5% +65 mesh, 3% +100 mesh. We do not use any silica sand because of its radical thermal expansion behavior. We use mostly mullite grog (rather than traditional brick or fireclay grogs). The grog particles contain almost no quartz, thus they are much more dimensionally stable during cooling through quartz inversion. The grogs contain no fines, they have a narrow range of sizes for maximum benefit. The recipe employs 15% fine phyrophyllite powder (a mineral with exceptional stability in radical temperature-change environments). The body is made purely from our finest high quality stoneware material. The bentonite addition greatly improves the plasticity. The grog constituent greatly improves the drying performance (the grog helps to terminate micro-cracks before they grow and assists in the healing process during joining). The drying strength of this body is very good. Thrown forms should dry without problem unless they have a very uneven cross section. It may be necessary to cover larger pieces (or those with thinner and thicker sections) with cloth and plastic to slow drying down enough to make sure it occurs evenly throughout. Raku bodies most often contain lots of grog to help them survive the stresses of firing and Plainsman Raku-Throwing is no exception. Grogged bodies are abrasive and obviously do not slip through the hands as easily as smooth ones, water is constantly needed to generate enough slip. Notwithstanding this, the fact that Raku-Throwing does not contain angular silica sand grog and it has a smooth clay base means that it throws with less discomfort than many other raku bodies and then our other native grog bodies (H440G, H441G, M332G). But it does not feel as smooth during throwing as our Sculpture clays. Since Raku-Throwing has a fine clay base it burnishes reasonablty well for a grogged body. You might find it helpful to make a slip of the material and screen out the grog, then paint this on and burnish. The body vents water well during early stages of firing. However if you bisque in an electric kiln, consider preheating overnight on low to give plenty of time for all water to be removed. If pieces are heavy it is very helpful to have a venting system to remove the water vapour as generated. Like any other raku body, this one is porous and non-vitreous in raku firing. As you can see from the fired test bars, it can be fired from cone 6-10 and beyond with no problems (at cone 10 reduction it is more porous, and thus less vitreous, than our buff stonewares). 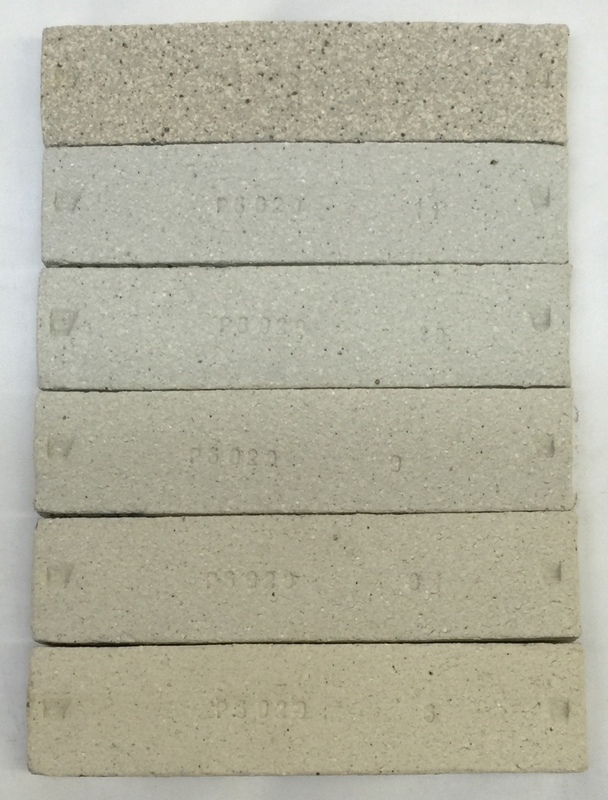 Fired test bars: Reduction Cone 10R (top), Oxidation Cone 11, 10, 9, 8, 6 (proceeding down). One caution: The raku community tends to employ metallic oxide colorants in ways that can generate significant metal fumes on firing. 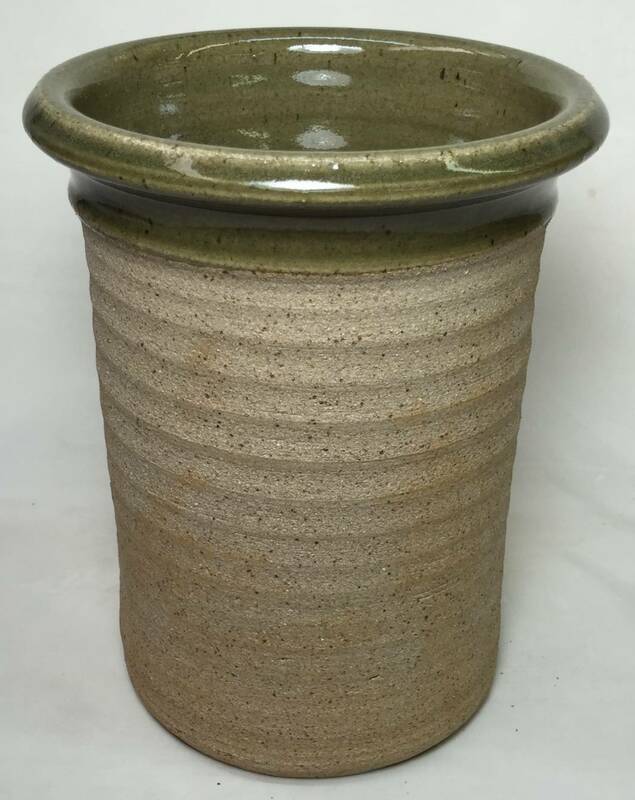 Be careful about breathing kiln vapors or using leaded and heavy metal materials. Do not eat or drink from raku vessels. Raku throwing also works well at cone 10R. The glaze is Ravenscrag celadon. Since this body has a low thermal expansion (and raku glazes often have high expansions) glazes will tend to craze. While this is often desirable in raku, keep in mind that a crazing glaze also severely compromises the already weak ware. To minimize crazing, avoid large amounts high expansion materials like nepheline syenite, feldspar and Frit 3110 in the glaze recipes (Frit 3124, 3195 and 3249 are low expansion). Designing a raku glaze is somewhat like making one for low fire ceramics. A viable approach is to create a good clear base glaze and then add colorants, opacifiers, and modifiers. The metallic effects, for example, are simply made by the addition of significant amounts of metal oxides to a clear base; you can learn these by studying existing recipes. Lead materials are not really necessary for raku, there are plenty of boron frits that will melt in low fire (i.e. Ferro 3110, 3124, 3134, 3195). A good base glaze can be as simple as 90% frit and 10% kaolin. Many raku potters also employ gerstley borate as a glaze base. A raku glaze can be made from 80% of this material and 20% kaolin. Others use a 50:50 mix of nepheline syenite and gerstley borate (although this is likely to produce severe crazing). Note however that gerstley borate is not a consistent material and it imposes application problems with the glaze slurry. Click here for web view.